I spent 5 weeks in Kenya and Tanzania during the summer of 2015. I went there because I wanted to go on a safari or two, and see the animals everyone is familiar with but not many people have seen in their natural environment. While I was there, I thought it would be silly for me not to climb a mountain, so I made some time to climb Mt. Kenya. The whole trip was incredible. Climbing Africa's second highest mountain, Mt. Kenya, was undoubtedly one of the most physically challenging experiences of my life. The mountain actually has three distinct peaks, and the two highest of these require technical climbing to summit. 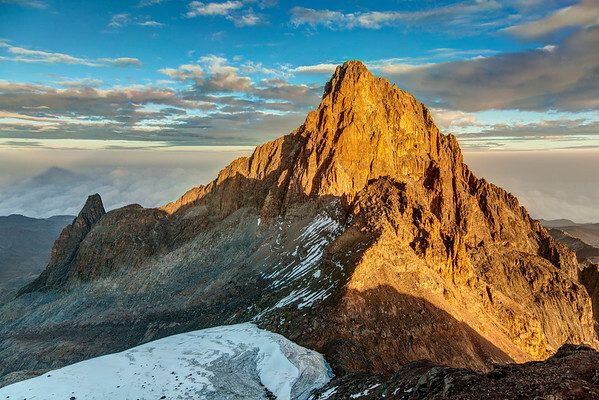 The shortest of them, Point Lenana, reaches an elevation of 16,355 feet, and doesn't require any ropes or technical knowledge to reach. It does, however, require an absurdly early start – something like midnight – from camp two, to reach the summit at sunrise, which I did in order to take this photo. At the time, I was so sick and tired that I honestly didn't really enjoy the experience. Looking back now, I'm sure glad I stuck with it. Available in the following sizes (Rectangle B): 12x8, 18x12, 24x16, 30x20, 36x24, 45x30. I'm not big on abstract photography, but when I saw this totally abstract scene, I knew I had to give it a try. 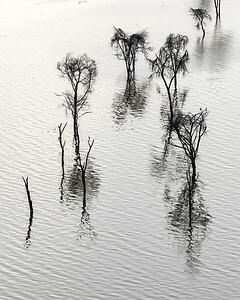 Lake Nakuru – the body of water shown here – lost a lot of water leading up to roughly 1990, but has since recovered significantly, putting these trees that grew up in the meantime under water. Available in the following sizes (Rectangle A): 8x10, 11x14, 16x20, 20x24, 24x30, 30x40. One wouldn't think that rhinos would be a particularly difficult animal to spot in a savanna where most of the grass is only a few feet high. But, unfortunately, they are endangered, and the African plains are massive, so it can require hours, or even days of driving around to spot any. 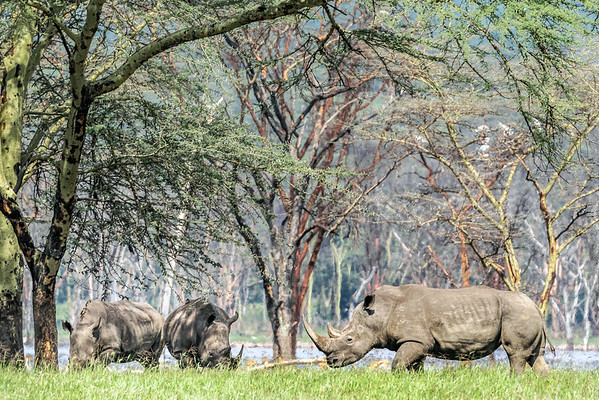 I was able to get quite close to most of the animals I saw on safari, but the closest I was able to get to these rhinos was several hundred yards. Available in the following sizes (Rectangle B): 12x8, 18x12, 24x16, 30x20. 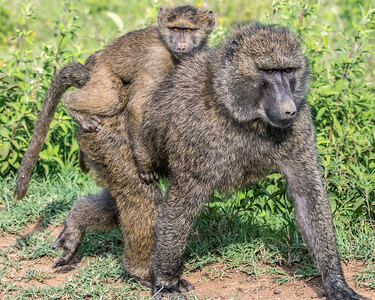 Seeing a baby baboon ride on the back of it's mother (or father?) shocked me the first time I saw it, but I quickly learned it is a common thing. It never ceased to be fun to watch! Available in the following sizes (Rectangle A): 10x8, 14x11, 20x16, 24x20, 30x24, 40x30. I don't know if I wasn't there at the right time of year, but I only saw a few large herds of animals during my trip to Kenya's Masai Mara National Reserve in the summer of 2015. This herd of several hundred cape buffalo was the largest grouping of a single type of animal in a confined area I saw during my Africa trip. Available in the following sizes (Panorama C): 30x10, 36x12, 48x16, 48x16 Triptych (3 x 16x16), 60x20, 60x20 Triptych (3 x 20x20), 72x24, 72x24 Triptych (3 x 24x24), 90x30, 90x30 Triptych (3 x 30x30). This lion walked right by my safari truck when we went on our sunrise drive in the Masai Mara during the summer of 2015. The early morning light is great in this shot. Available in the following sizes (Rectangle B): 8x12, 12x18, 16x24, 20x30, 24x36. Wildlife seems to follow generally predictable patterns around the world. Animals are most active in the early morning and evening hours, and tend to be much more sedate throughout the day. This was certainly true of the lions that I saw while in Africa. If I ever chanced to see any in the middle of the day, they were almost guaranteed to be sleeping. So it was a pleasure to see these two actually wandering around as the sun rose on Masai Mara Nature Reserve, Kenya. Available in the following sizes (Rectangle B): 12x8, 18x12, 24x16, 30x20, 36x24. The weather I experienced while on safari in Kenya was great. It was very comfortable, and usually sunny, perhaps with scattered clouds. I did experience a bit of rain, though, for something like 5 minutes on one particular day, and it didn't just rain, it monsooned. Rarely have I seen rain this heavy before, or since. 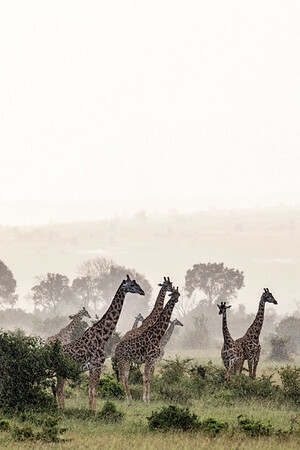 I was lucky enough to be near a herd of giraffes as the skies opened up on me, and the conditions allowed for a fairly unique appearance to this shot. Available in the following sizes (Rectangle B): 8x12, 12x18, 16x24, 20x30, 24x36, 30x45. I saw a ton of elephants on my summer, 2015 safari in Kenya's Masai Mara National Reserve, but it was usually from a distance. This guy, however, allowed us to get quite close to him. Available in the following sizes (Rectangle B): 8x12, 12x18, 16x24, 20x30, 24x36, 30x45. 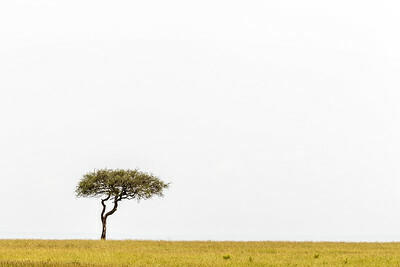 The savanna of Kenya's Masai Mara National Reserve, and Tanzania's Serengetti stretches for hundreds of kilometers, and while there are areas with hills, rocks, and even forests, a major portion of the land is seemingly endless grassland, interrupted only occasionally by a tree or two, like the one shown here. The feeling of solitude and emptiness is quite calming … until you remember that there could be lions prowling through that same grass, and then the calm kinda fizzles. Available in the following sizes (Rectangle B): 12x8, 18x12, 24x16, 30x20, 36x24, 45x30. Of Kenya's “Big Five” (lion, elephant, rhinoceros, leopard, and cape buffalo), the leopard is generally the hardest to spot. 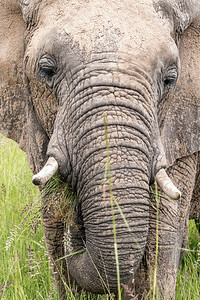 I was lucky on my trip to Masai Mara National Reserve, because I saw one on my first day of safari. 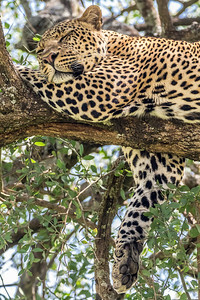 My driver spotted this leopard sleeping in a tree in the morning. We watched him for a while, and eventually gave up hoping that he would actually do anything more entertaining than lie around. He did move around just a bit, and even fully opened his eyes just long enough for me to take this beautiful photo. Available in the following sizes (Rectangle A): 8x10, 11x14, 16x20, 20x24, 24x30, 30x40. Of Kenya's “Big Five” (lion, elephant, rhinoceros, leopard, and cape buffalo), the leopard is generally the hardest to spot. 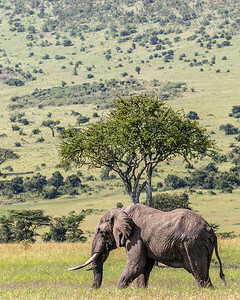 I was lucky on my trip to Masai Mara National Reserve, because I saw one on my first day of safari. My driver spotted this leopard sleeping in a tree in the morning. We watched him for a while, and eventually gave up hoping that he would actually do anything more entertaining than lie around. When we returned to the same tree later that evening, guess who was exactly where we'd left him? Available in the following sizes (Rectangle B): 8x12, 12x18, 16x24, 20x30, 24x36, 30x45. I must have seen over a hundred elephants during my time in Kenya and Tanzania. Generally, they were seen in groups, but this old guy was off wandering on his own through the savanna of Masai Mara National Reserve, Kenya. Available in the following sizes (Rectangle A): 8x10, 11x14, 16x20, 20x24, 24x30, 30x40. 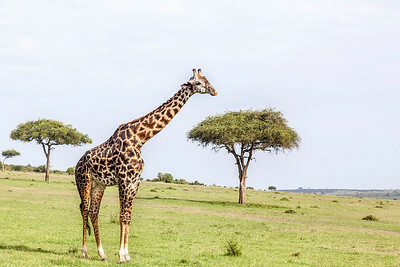 Giraffes frequently travel together, so it can be hard to get a photo of a single giraffe. I was able to do just that, however, with this guy. I had to ask the driver of my safari vehicle to back up a bit, then move forward a tad, then back, then forward, in order to get him placed between the trees in the background, but I think it was time well spent. Available in the following sizes (Rectangle B): 12x8, 18x12, 24x16, 30x20, 36x24, 45x30. 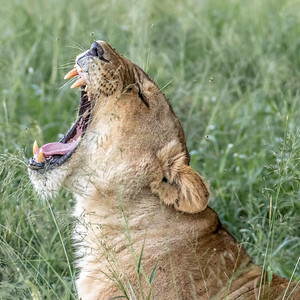 I came across two sleeping lionesses in Masai Mara National Reserve, and I was able to convince my driver to stick around for what must have been close to an hour, before one of them finally woke up long enough to let out a big yawn. Immediately afterwards, she went right back to sleep. Available in the following sizes (Square): 10x10, 12x12, 16x16, 20x20, 24x24. Nature is weird. 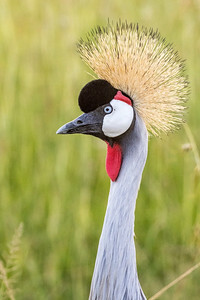 But sometimes that weirdness gives beautiful results, like this undeniably-odd grey-crowned crane. Available in the following sizes (Rectangle B): 8x12, 12x18, 16x24, 20x30. 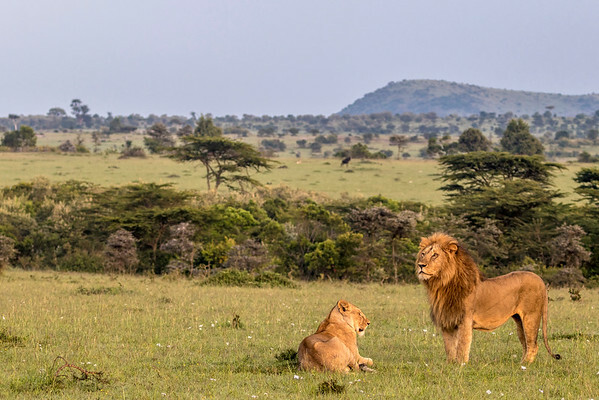 I saw more animals than I can count on my trip to Masai Mara National Reserve, in Kenya. 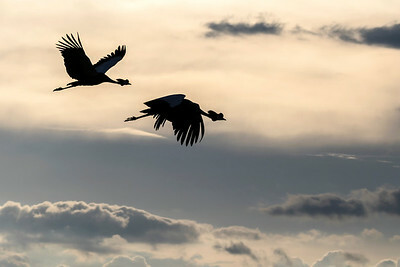 Here are two grey crowned cranes, silhouetted against a cloudy sky. They landed not far from the safari vehicle I was in, and we were able to continue watching them for some time before they again took off. Available in the following sizes (Rectangle B): 12x8, 18x12, 24x16, 30x20, 36x24. 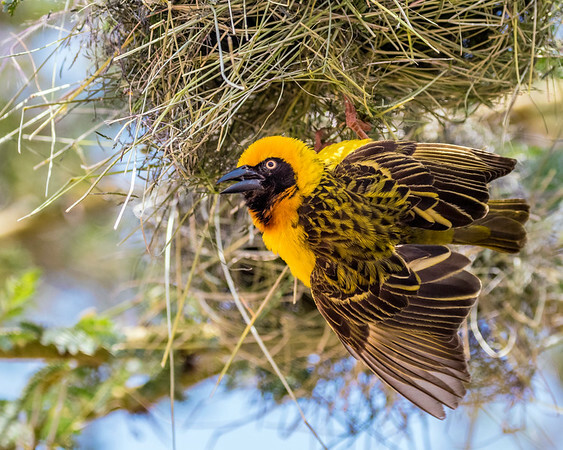 I spotted this yellow weaver (along with a hundred or so of his friends) at a rest stop an hour or so before I made it to Masai Mara National Reserve. While my companions for the safari were enjoying lunch, I was happily snapping photos of these absolutely astounding birds. Available in the following sizes (Rectangle A): 10x8, 14x11, 20x16, 24x20, 30x24. 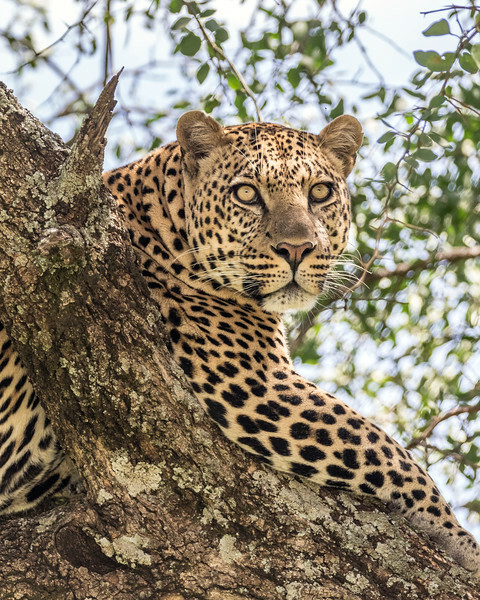 Of Kenya's “Big Five” (lion, elephant, rhinoceros, leopard, and cape buffalo), the leopard is generally the hardest to spot. 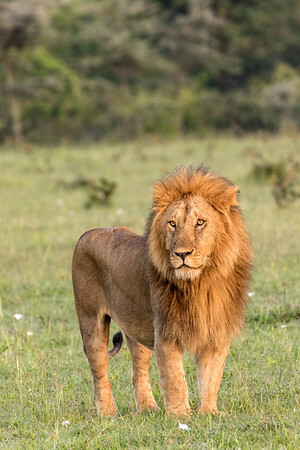 I was lucky on my trip to Masai Mara National Reserve, because I saw one on my first day of safari. My driver spotted this leopard sleeping in a tree in the morning. We watched him for a while, and eventually gave up hoping that he would actually do anything more entertaining than lie around. He did move around just a bit, and even fully opened his eyes just long enough for me to take this beautiful photo.